On Saturday, I had the pleasure of serving as a hat contest judge at the Alicia Rhett Tribute Tea at the Lone Oak Community Center in Lone Oak, Georgia. Held as a tribute to the actress who played India Wilkes in Gone With the Wind, the tea was a benefit for Allen-Lee Memorial United Methodist Church in Lone Oak, Georgia, the church attended by my friend and former colleague Winston. 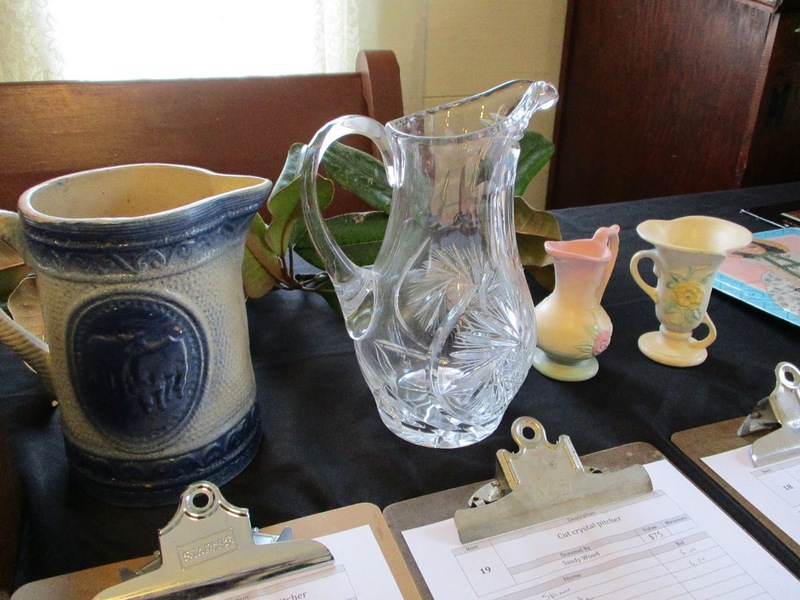 The tea's proceeds are being used to make the 1840s-era Allen-Lee handicapped accessible, so I was pleased to help (I made teapot-shaped shortbread cookies), and the tea was sold out and resulted in a packed community center. 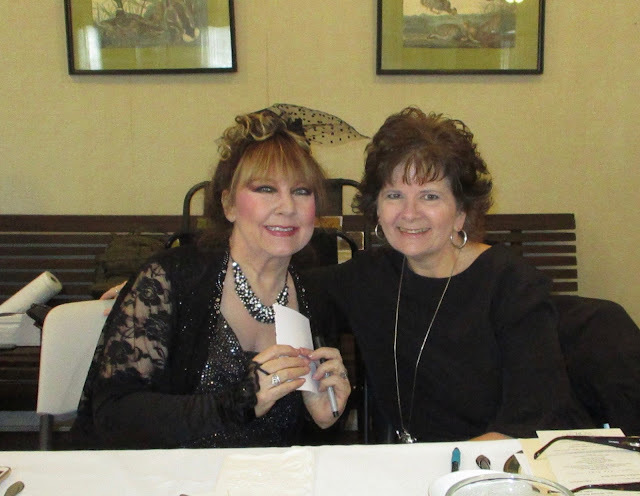 One of the highlights of the day for me was getting to know my fellow hat contest judge, Terry Lynn Crane, above. Her late husband, Fred Crane, spoke the first lines of GWTW and appeared as Brent Tarleton, one of Scarlett O'Hara's suitors in the film's opening scene (click here and you'll see Fred at left). Fred was quite handsome even when he passed at age 90 in 2008, and Terry Lynn pulled out her phone and showed me lots of photos of a still-dashing Fred in his later years. We made a great judging team and immediately agreed on the top three winners in both the costume contest and the hat contest. The first two ladies in this photo won the hat and costume contests, respectively. There was also a silent auction at the event, and I bid on and won the delicious India Wilkes fan blend tea from Adagio, which was actually the tea served at the event (more on that later in the week). 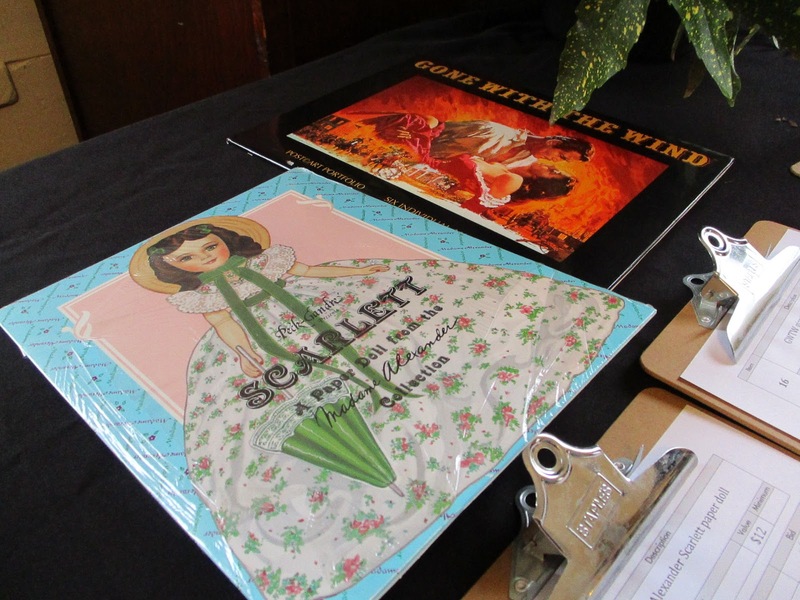 And a lot of GWTW fans went home happy with a great array of memorabilia they won. The actress who played India Wilkes, Alicia Rhett, appeared in only one movie, GWTW, and she later made a name for herself as an artist. When I was a young newspaper reporter in the late eighties, my friend Winston and his wife, Lynn, were excited about traveling to Charleston so Alicia Rhett could create pastels of their daughters, Sallie and Jane. I was surprised to find that they still have the actual dress Sallie wore, shown here on display at the tea next to the Alicia Rhett portrait of Sallie. 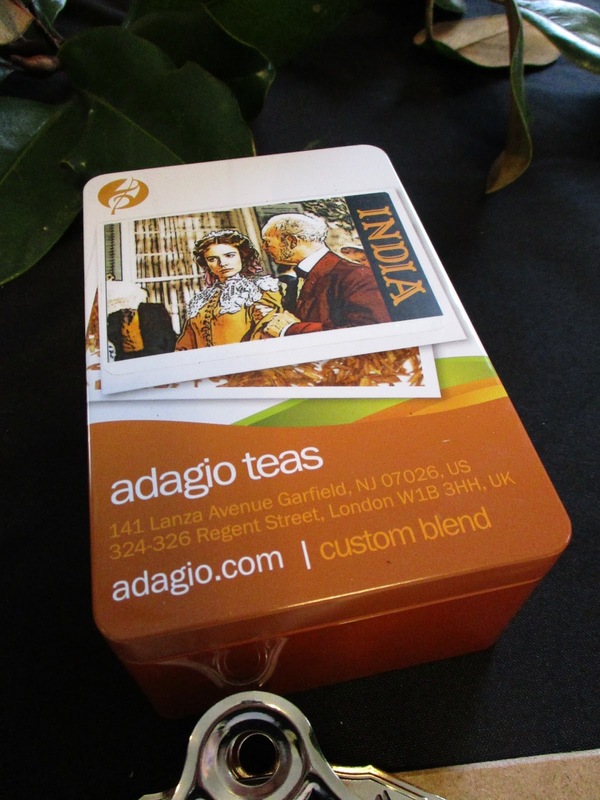 (They may have Jane's dress as well, but she lives in California now and wasn't at the tea.) 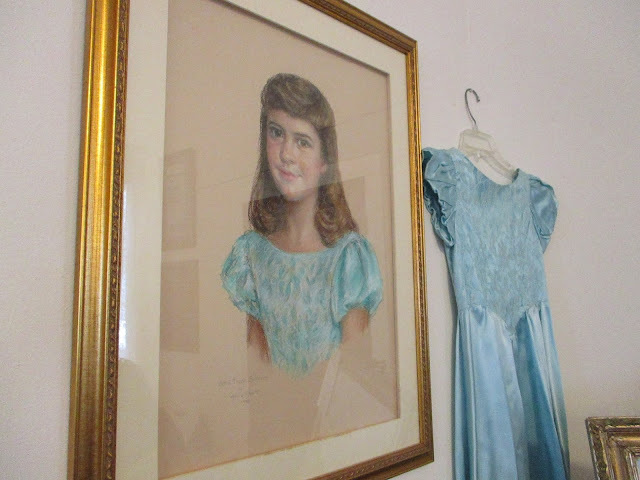 I've always thought this was so amazing, because how many people have portraits of their daughters that were created by an actress in Gone With the Wind! 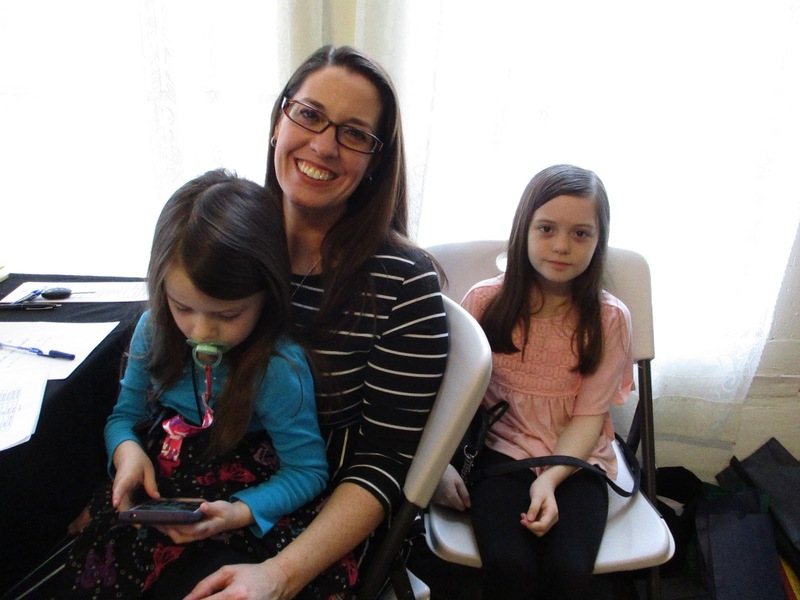 Here are Sallie and her own daughters, Quinn (who was a little bashful) and Clair Lynn. Fun to see them as the little girls that I once knew their mom and aunt to be! Other artwork displayed at the tea included this lovely painting by local artist Nita McFarlin, whose son is the pastor of Allen-Lee UMC. 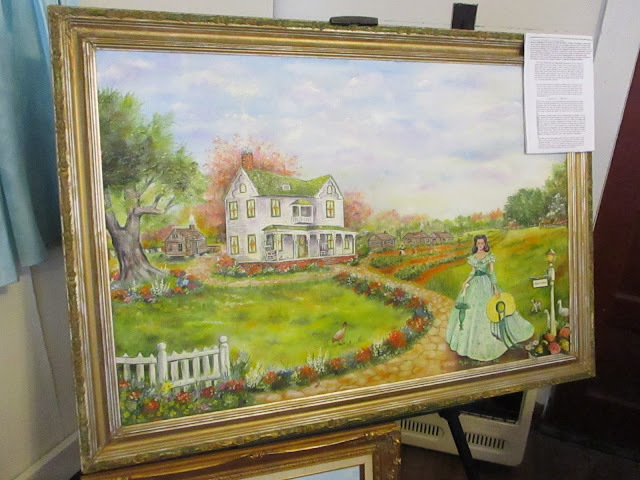 And Mrs. McFarlin also painted this portrait of Scarlett O'Hara at what many agree would have been much more likely to be the real-life Tara than the grand mansion that Hollywood created for the movie. 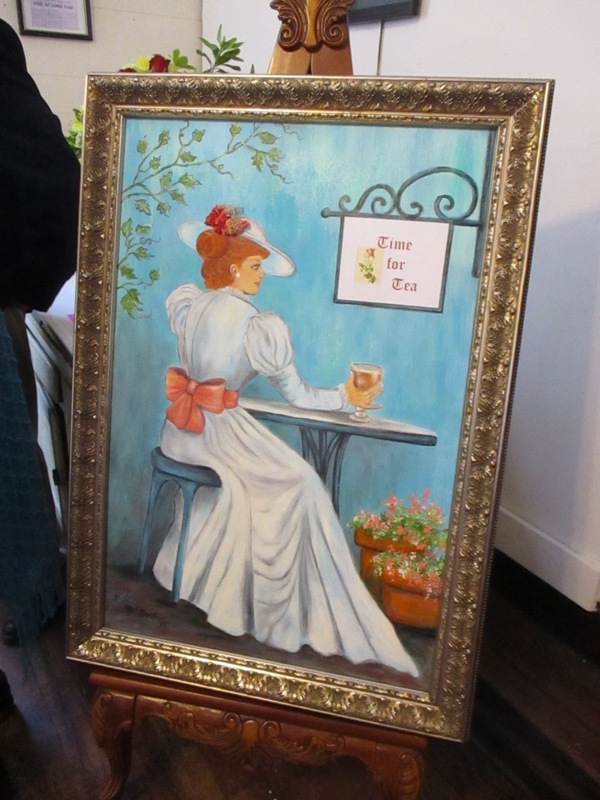 Coming Wednesday: More scenes from the Alicia Rhett Tribute Tea … and a bit of Fiddle-Dee-Dee! 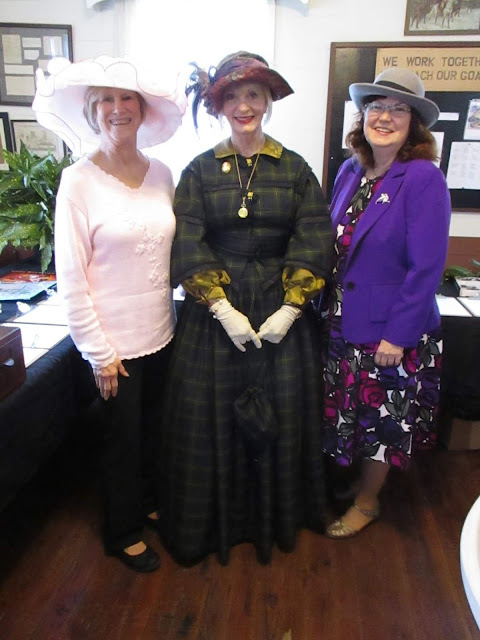 What a lovely and gracious event that must have been....sweet southern ladies dressed in their hats, enjoying an afternoon tea to benefit a small town church. I love it! Such niceties are almost "gone with the wind".. I'm glad to hear the tea was such a success! It sure sounds like fun, and your photos are great. What a very special tea time. Thanks for sharing it with us. Looks like a lovely day. Glad to hear the tea was a success. Oh how fun! Can't wait for your next post about the event.